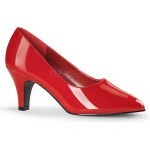 Wide width red pump comes in larger sizes up to 16. Classic style for men or women. Red faux patent leather pump has clasic silhouette. 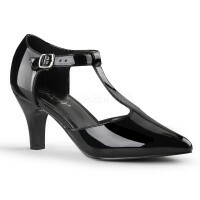 The sculpted heel is a comfortable 3 inches. Made only in sizes 9-16, it is perfect for crossdressers and TG men as well as those of us who need a larger size shoe. All man-made materials with a padded insole and non-skid sole. Item Number: PL-DIVINE-420R | Approximate Size (Inches): 8.00 wide x 10.00 deep x 6.00 high | Approximate Shipping Weight: 3.00 lbs.